The XS series of chillers and heat pumps are extra compact solutions – when space is limited. The XS solutions are the size of a normal household refrigerator and the obvious solution for narrow spaces. 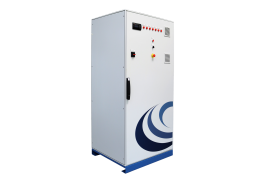 The XS series is useful for numerous heat pump and chiller applications. *For higher temperatures, please contact BUNDGAARD Refrigeration. Bundgaard Refrigeration is certified according to ISO 9001 – the international standard for quality management. – den internationale standard for kvalitetsledelse.